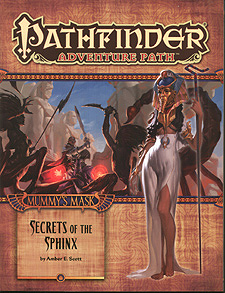 "Secrets of the Sphinx,” a Pathfinder adventure for 10th-level characters, by Amber E. Scott. An exploration of the sinister world of curses, by Russ Taylor. Two exciting additional encounters in Osirion’s wastes, by Greg A. Vaughan. Reptilian rage and unexpected rescue in the Pathfinder’s Journal, by Amber E. Scott. Five new monsters to challenge player characters, by Michael Kortes, David Schwartz, and Larry Wilhelm.